Two years ago I wrote a blog about life being like a chapter book. Each segment of life is a chapter, and when one ends, a new one starts. I originally wrote about my stepping out of the fitness industry (with full intentions of coming back), closing that chapter while I open a new one. One filled with a bike racing journey full of highs and lows, a journey where I could focus 100% of my time on racing, just to see how far I could go. How far can I push my body? What are my limits? With the closing of that chapter I opened up a new one focused solely on bike racing, fully knowing the future of my hip. Last week I walked into my surgeons office for my 4 month follow up visit, and had a flash of nostalgia as I was walking out of the office, for the last time (we hope). When I got to my car, I turned around for one last look at the building, I snapped a picture, and I waved good bye. It's funny what changes in a year. Last year at this time I walked out crying, so thankful that I made it four months post op, and was so excited, yet so scared to start pushing my hip. I had flash backs not just from my first trip into the building (more on that later), but flash backs to the start of this chapter. This hip chapter is interwoven amongst so many other chapters of my life. My first summer of mountain biking. I was 25 when I went for that 30 minute easy run and ended up limping for 25 minutes of it. I was in my final year of Grad School studying "Human Movement and Performance" and I was convinced I knew everything there was to know about my body. I was 27 in 2012, that's when my back started hurting. I thought it was from cyclocross and and traveling. It hurt a lot. I was 30 when my hip took a turn for the worse. I figured I nursed it back to a pretty functional state for 5 years, why couldn't I do it again. I did what I did before, only this time nothing I could do would make it better. Rest wasn't helping, taking out the aggravating activities didn't help. I raced on it, that didn't help. I started PT. I was 31 when I walked into my surgeon's office. It took me 6 years to walk into that office. 6 years. 6 years of denial that anything horrible was wrong. 6 years of sitting with what felt like someone was lighting a torch in my hip. 6 years of basically quitting running (my original love before biking) because it hurt too bad. 6 years of just never quite feeling "normal", but what wasn't normal to some, became my new normal. In those 6 years I wrote more than 1 chapter of my life, but what remained a constant, was this damn hip. In those 6 years before walking into that office I graduated with my Masters, I moved in with Chris, I learned how to mountain bike, my brother came back from rehab, I got engaged, I got married, I became a professional CX racer (whaaaaaaat), my grandma passed away, I raced more bike races than I can count on my fingers and toes, I went through a total of 13 bikes. That's a lot of bikes! That's a lot of transitional life that was being lived. I can't tell you exactly why I walked into my surgeon's office when the thought of surgery wasn't even in my mind. I think I wanted answers, even though in my gut I knew what was wrong. I remember walking into that building, looking around and thinking to myself "I"m way too young to be here". I remember the anxiety, the nervousness I felt. I'm pretty sure the only words I mumbled to my surgeon that day was "I don't want surgery". I walked into that office set on NO surgery. I walked out crying. I remember feeling blank as I sat there in his office. I felt empty inside, scared, worried, concerned, confused on what I ACTUALLY should do. I had a lot of internal conversation with myself after that initial appointment, and when I went back in for a follow up after my MRI, I was open to surgery. It's funny, there are moments in my life I think I'll remember forever, and then there are some I wish I could forget. It's those I think I'm going to hold onto till the day I die that I forget, and it's things like every single ortho appointment I remember. I can tell you every month I went to see my surgeon and everything that was discussed in each appointment. I can tell you which appointments Chris came with me and which ones he didn't. The past 2 years have been so pivotal in my life it's like every moment happened yesterday and I can see the detail of it all like it's right in front of me. April 2016, May 2016, October 2016, Feb 2017, April 2017, May 2017, August 2017, September 2017, January 2018, Feb 2018, March 2018, May 2018. 14 visits (2 of those being surgery). In retrospect, 14 isn't that big of a number, but this nostalgia I'm feeling from that last visit reminds me of my first. I feel blank, confused, lost, and almost empty, but yet happier than ever to end this chapter. I'm struggling to find words that truly express how I feel right now, and how I felt when I walked out of that office. The only thing I can compare it to is how I felt when I finished reading the Harry Potter series. Seriously! I finished reading those books, and I felt like I lost my friends. I all of the sudden had all this extra time and I didn't know what to do with myself. 14 times isn't a lot to see someone, but it's enough to make something feel like a routine. Walking into that building, checking in, waiting, seeing the MA, talking with my surgeon, all became a routine in my life for the past 2 years, and it's very strange for it to end. Don't get me wrong, I won't miss the drive, the waiting, or the fact that I felt like I've been on a leash for the last 2 years, but it is enough to make it feel like a loss (in an extremely strange way). My surgeon has been very involved in the whole process from pre-surgery, to post-op, to rooting for me in my racing. It's strange to think that someone who has entered into your life for an extremely pivotal time is just done. What's even stranger to me, is I know I'm just another number, another patient. People come and go, and with enough time those memories fade. When I spend a significant amount of time with someone (and I would consider 14 visits significant), I take it personally. It's probably a small character flaw at times, but truth be told, I'm going to slightly miss those 20 minute appointments, sometimes talking hips, bikes, racing, and me asking ridiculous questions, me trying to negotiate for more time on the bike (or me trying to go on an ATV tour in Hawaii) and him telling me no. I won't miss the "no's", but I'll miss the ridiculousness of it all. I'm not 100%, and I still have a lot of recovering to do, a lot of listening to my body and my hips, and a lot of work to put in before I'll be anywhere near ready for the CX season in September, but at this point, I'm nearing the closing of this hip chapter. As I reflect back on the past 8 years there are so many people I have to thank who helped get me through everything. 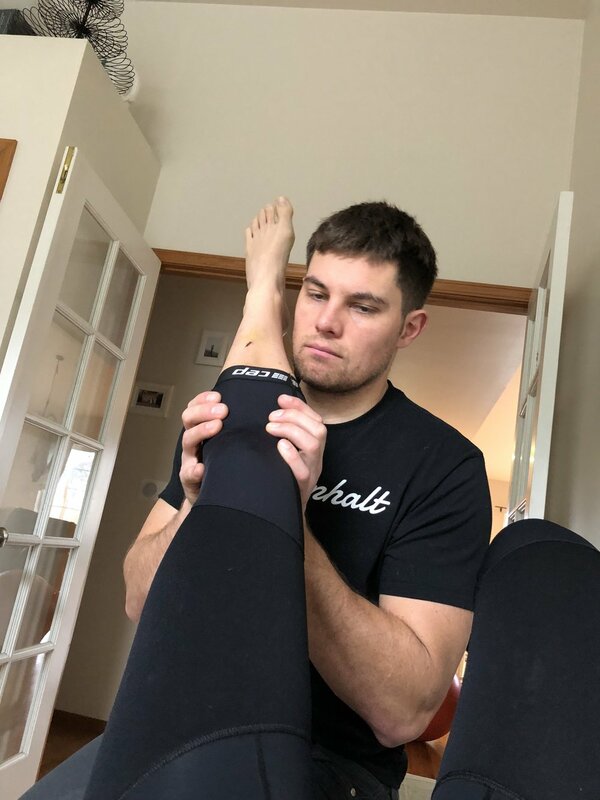 Obviously a thank you to my husband, Chris, for spinning my leg(s) in circles for nearly 56 hours over the past 2 years (subtract a few hours from the days I was in PT for that and the days he went to work). Thank you for cooking me 3 meals/day for the first month after each surgery. For shaving my legs, lifting me in and out of bed, in and out of the car, on and off the toilet, in and out of the shower. For waking up at 3am every night for the first couple of weeks to take me to the bathroom. For lying with me through the first surgery when I was crying my eyes out scared I would never recover. Thank you for putting up with my ever expanding PT/exercise tools, for understanding that I CANNOT DO THAT because of my hip. For putting the Compex on and taking it off my glutes, for cupping and taping my back. For dealing with my total and complete OCD. Thank you to Erik Deroche at Performance Health Northwest for being my chiropractor for the past..um I don't even know the amount of years, but he's been here since the beginning of this saga. Thank you for talking to me 2 weeks after my first surgery and telling me I was crazy for thinking I wouldn't be in pain 2 weeks after surgery. Thank you for your continuous treatments, your man hands that release those muscles so fantastically. Thank you for spending extra minutes talking to be during pivotal times of this process. Thank You. Thank you to my PT and friend Sarah at CorePhysio. Thank you for being such a caring provider, for getting me through my Pre-Op pains, getting me through my CX season in 2016 when we knew I was going in for surgery at the end of it. Thank you for your knowledge, your time outside of the PT clinic, and for talking me off so many cliffs during that first recovery. Thank you for spinning my leg(s) in circles. Thank You. I think the world of you. Thank you to Meg who took good care of me while Sarah went on maternity leave. Meg, you got me through my first CX season after hip surgery. Thank you for your crafty exercises and fun personality. Ash. My acupuncturist. Thank you. Thank you for knowing what I need when I didn't even know I needed it. Thank you for your ever expanding knowledge base, your care to learn and your care for your patients. Bellingham is lucky to have you. Kerry. My massage therapist, thank you. Thank you for your support when I did my first MRI with contrast, for letting me text you when I was worried, for your wise words, your wisdom, and your wealth of knowledge. Thank you for your elbow grease in my TFL's, heaven knows I need it. My Bellingham hip sisters. Thank you for keeping me going this second round. I'm so happy to have you two in my life. Without these crummy hips, we wouldn't have each other. My coach. My poor coach. A couple of weeks after we started working together I had my MRI and informed him of my labral tear in my hip. I think nearly every check up he's asked "how are you doing, how are your hips". Thank you for putting up with my stupid hips, working around them when we've needed to. Thank for checking in on me after my first surgery and helping me through it. Thank you for your patience, your knowledge, and your guidance. Thank you for getting me back on top after my first surgery. Thank you, I owe so much of that first season back to you. No amount of thank you's can truly show my gratitude. Thank you Dr. Nowak for caring. I know you could have easily given in to my requests when I asked to do more, and you said no. You cared enough about my healing to give me guidelines to make sure I would heal, to make sure there would be no flare ups, and no problems. You pieced me back together to become a better athlete, whether you know it or not. Thank you to my sponsors who didn't care that I had hip surgery 7 months before the start of the season, and still supported me. To the new ones who took a gamble on a freshly injured girl and the old ones who stuck by my side. I'm one lucky gal. Thank you to my community, my support, my tribe, and all of you who have reached out to me during the last couple of years. Thank you for rooting for me, for following along on my journey and actually CARING. Your energy powered me through that first come back. Heres to a continued upward direction of recovery, for this road is still long and there are still ups and downs to be had. I'm still on a leash for PT, but we're slowly moving towards more and more FUN and exciting things! These last two years have written a chapter of growth in life and sport. I have more compassion for the injured, more gratitude for my body, and more thankfulness for those around me. This chapter is a bright light in a crumby situation. Thank you for being there, for reading, for following, for being you.